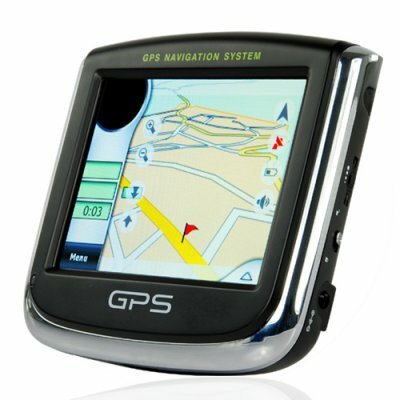 Successfully Added Ultra-Portable GPS Navigator - 3.5 Inch Touchscreen Mini GPS with Media Player to your Shopping Cart. Ultra-Portable 3.5 Inch Touch Screen GPS Navigator + Media Features. This model comes with a user-friendly menu navigation system for the best user experience possible from a portable GPS Navigator. Are you a more or less an "average" driver who would only use a GPS navigator occasionally? Then you certainly don't need all the bells and whistles that normally comes with the more expensive types of GPS systems, right? Well, whatever means of transportation you're using, be it car, bike or even on foot, we present to you this unique ultra portable GPS navigator that smoothly fits in your pocket or carry-on bag and supports all of today's most popular GPS software’s such as TomTom and Route66. The CVGY-CS12 is designed to work straight out of the box, all you have to do is insert your GPS SD card and that's it! The embedded software makes it very easy to access the menu systems and select your desired location quickly - even for beginners! So if your tired of always having to stop and ask for directions, then step-up to the wonderful world of Global Positioning technology at its finest (GPS), because whether you are an experienced user or novice we've found the perfect GPS navigation system for you. Not only is this model the perfect pocket sized GPS unit, it can also be used as a digital media player if you occasionally take the train or travel outside of your car frequently. Now you can see where you are going and enjoy the trip at the same time! So, whether your cycling, walking or driving, the portability of this ultra unique GPS unit will get you to your destination on time and in top shape. This is yet another awesome GPS touchscreen navigator that is perfect for the resale market, whether you have an online or physical store, and is available to you direct from the leader in wholesale electronics, Chinavasion. World wide use GPS Navigator. 3.5 inch touch screen unit with media features such as MP3 & MP4 players. Connects to your computer easily for quick file transferring. We recommend carefully reading the user manual for your most satisfactory user experience. How I can I Connect the GPS unit to my car speakers system? There are cassette converters with a 3.5mm jack lead that you can purchase in most electronics stores, just insert the cassette in to your cars cassette player and plug in the 3.5mm jack to the headphone plug-in on the GPS unit. Does this unit support Greek language? If your GPS software support your native language, then the display and voice language will be in your native language. Most map software comes with a wide selection of language choices, which means both the display and sound (voice) will be in your preferred language. However, you should carefully select and buy the map software that is best suited for your region of the world. We want to install SYGIC DRIVE as the GPS software. Is this possible? The GPS system should work with SYGIC DRIVER, however Chinavasion does not hold any responsbility for the installation of GPS software/maps. Great product, nice built, comes with SD 2GB card inside, good transaction, fast delivery, good staff comunication, overall ... 10 stars from me !!! Looks good, works well. fast delivery, good packaging Happy customers - just wish they came with usb power sockets. Chinavasion's service is the best! Nothing to complain! All the things I bought are excelent, this GPS is just another example! I will definately buy from you again.